In the church and monastery of the Santa Domingo can the remains of the impressive Temple of the Sun still be seen. Temples are built to honor the elements of nature as lighting, wind, the Sun (Inti), the Moon (Quilla), etc. 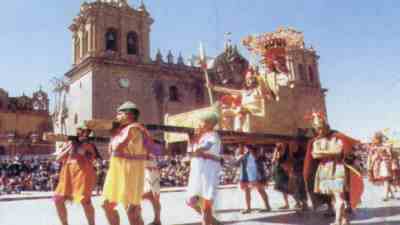 After the initiation at this most sacred temple (once considered as the very center of Tawantinsuyu from where the four provinces started) moves the procession on the same route they took 600 years ago to the fortress of Sacsayhuam�n. 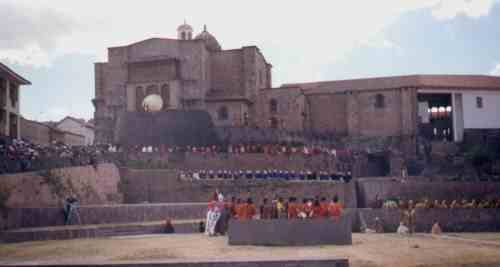 The Inca is carried in a replica of his famous golden throne. When the conquistador Francisco Pizarro won the battle on the Plaza de Armas of Cajamarca in 1533, it is said he claimed the throne as his personal trophy. Its weight was 80kg of pure gold. Ok, back to Cusco. Next to the Inca walks the high priest in deep meditation. This highest spiritual representative in the empire had the same consideration as his brother the Inca and maybe higher. For many state affairs asked the Inca advice to the high priest. In the background of the picture stands the proud Catedr�l as a pearl on the Plaza de Armas.